The Mike Mignola’s Artist’s Edition is a very large (430 x 280mm) hardcover book that presents the original black and white art pages created by Mignola for Hellboy in Hell Volume 1: The Descent. 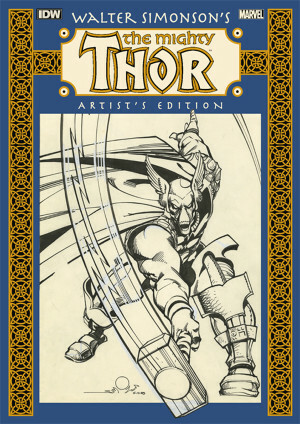 IDW’s Artist’s Editions present a way for readers to view an artist’s original comics art pages for a fraction of the price that a single page would cost to own, were they even available. Each sheet of bristol board, watercolour paper or other large page of pencilled and inked drawings is photographically scanned in colour at very high resolution and reproduced actual size, on heavyweight paper. This produces the sensation of looking at original drawings exactly as created by the artist with all the marks, corrections and artefacts visible. These handmade traces are usually hidden when printed at reduced size, so it’s a very different experience to look at comics art in its raw state. All 113 pages drawn for the first five issues of Hellboy in Hell are here, including cover art, back covers and variant covers. 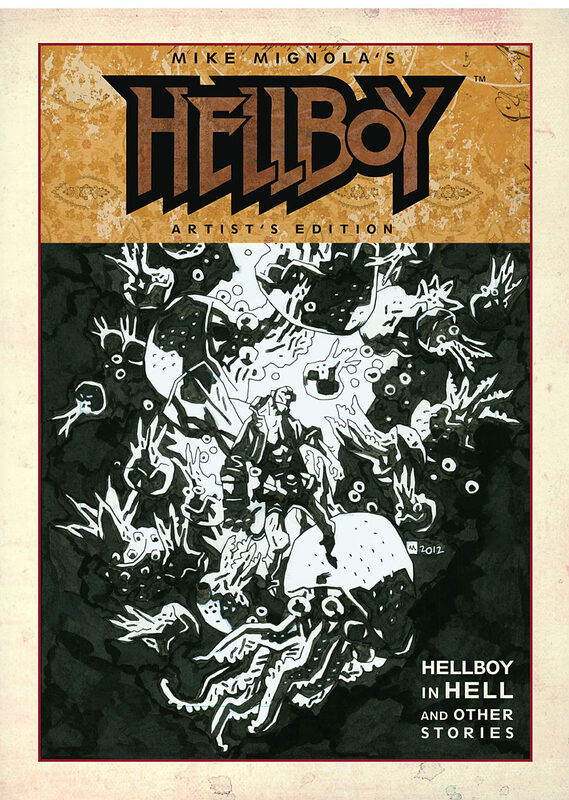 It also includes 63 pages of art from earlier Hellboy stories: the first two promotional four-pagers for the San Diego Comic-Con and the Comics Buyers Guide; the ten-page story ‘Faith’ that appeared in John Byrne’s Nextmen #21; two stories that appeared in The Dark Horse Book Of The Dead,’ The Ghoul, or Reflections on Death and the Poetry of Worms’; and ‘The Troll Witch’ plus the art for fan-favourite Hellboy story, ‘The Corpse‘; the covers for two issues of Hellboy: Seed of Destruction and five other pages of art. 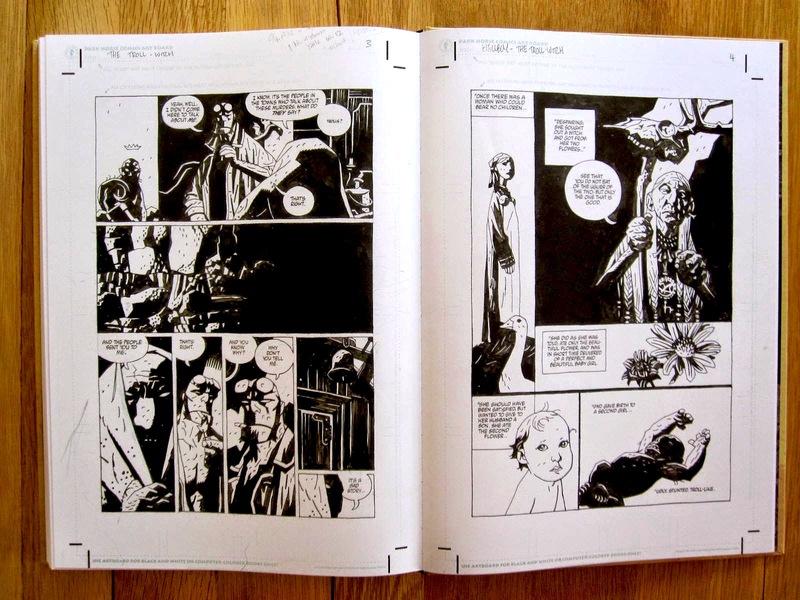 Mignola’s original art pages look different from their final printed form. All the black areas are dramatically alive here with texture from brushstrokes and pencil marks, but most striking of all is the absence of speech balloons and captions for all of the pages from Hellboy in Hell. Text was added digitally from acetate overlays, and the only lettering on these pages is sound effects. If you want to ‘read’ the art conventionally, you’ll need a copy of the original printed comics open next to these pages. All the pages from earlier stories produced pre-digitally are fully lettered and you can see all the paste-ups, corrections, and marginal notes. 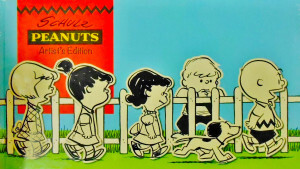 All production details and original dates of printing are noted separately. There is a bio of Mignola at the end, but if you have the printed stories you will know most of the information already. For Hellboy fans, this is a great way to appreciate the work of a uniquely original creator.